renting, are contained in the Lease Agreement or Rental Agreement that is entered into with the Landlord. Guarantor or Co-Signor, they are also liable. be legally defensible or enforceable. who are contemplating such an agreement can modify, add, or delete clauses to meet their particular needs. final copy for their file. This is a legally binding agreement. If you do not understand it, seek legal counsel. A. Lease or Rental Agreement for the premises. premises. Each roommate stated above agrees to faithfully abide by all the terms and conditions of the Lease. The Lease Agreement commenced on______________, 200___and terminates on______________,200___. 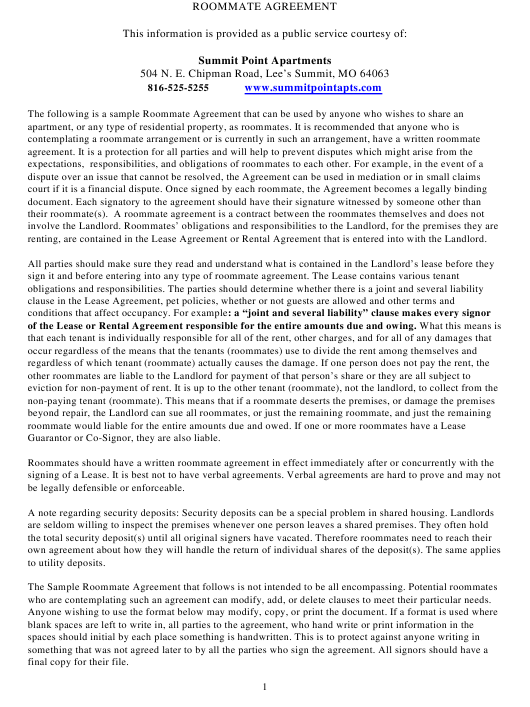 several liability of the tenants under the Lease Agreement with the Landlord. such dispute cannot be settled directly by the roommates. B. Rent, Fees, and Other charges. share of the rent and forwarding to the Landlord as specified in the Lease Agreement. of rent and other occupancy payment information. D. Utilities and Renters Insurance. included in the rent that is paid to the Landlord. he/she is liable is issued by the utility. of a dispute or if one or more roommates are out of town and the remaining roommate(s) have to pay a bill. in the event of fire, water damage, or natural disaster. Roommate name____________________ ___will purchase renters insurance ___will not purchase. Roommate name____________________ ___will purchase renter’s insurance ___will not purchase. _______will not be permitted on the premises _______will be permitted on the premises. be allowed under this agreement and in accordance with the Lease agreement with the Landlord. d. Firearms: All roommates agree that firearms will not be kept on the premises. premises and in accordance with the Lease Agreement with the Landlord. will be expected to promptly vacate the premises (the rental dwelling). and signed by the roommates.